Weddings, keynotes, product unveilings, conferences or any event that include projectors, slideshows, recordings, or presentations are a big deal. It must be otherwise you wouldn’t go through the hassle of trying to create a customised entertainment experience. No matter how big or small your event is, you are having that event for a reason. It’s to tell a story. You can’t tell a good story without presentations, slideshows, video clips, etc and creating that story by mixing media can be difficult. There are a few ways, though, to handle mixing media together that’s being pushed to a single screen. One of the most graceful ways is with AV switchers. What are AV Signal Switchers? Av and signal switchers are complicated devices that take multiple audio and video sources from different places and send them to a single output. 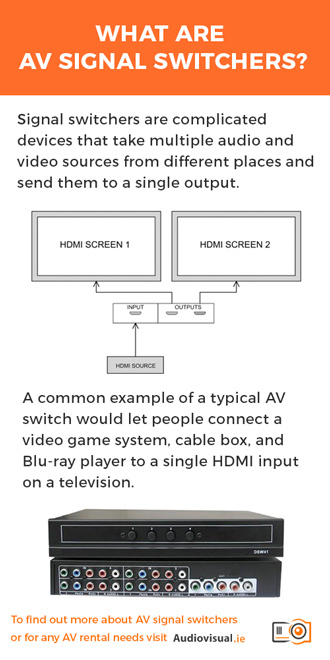 In the consumer space, a typical AV switch would let people connect a video game system, cable box, and Blu-ray player to a single HDMI input on a television. That’s the basic principal of the higher end switches used in large media except the pro-grade AV switchers handle switching between streams in a more graceful fashion. Pro grade AV switchers will handle multiple sources, connecting to many different input types, at multiple resolutions and switch between them seamlessly. Some switchers have scaling capacity which will also scale the output image to a specific predetermined resolution. (I will cover this in a later blog). Another upcoming type of signal switcher is a tricaster. A tricaster replaces the old fashioned media mixing switchers that would create overlays and converge two audio/video streams into a single output stream creating a result like you might see on the local news at night. It’s a cheaper option that is more software driven and easier to use. It’s important to know tricasters exist because these devices have a foothold in the world of podcasting and online event streaming (post about podcasting coming soon too!). What Are Signal Switchers Used For? The easiest example is a wedding or an event like the Grammy awards. A wedding might capture the speaker via camcorder in real time and project them on a screen so the audience can see them easier. The wedding host might then want to present a series of slide shows or premade videos to show everyone. An AV switch would take care of switching between the live video feed of the wedding host and those picture slides. Likewise, at awards shows, a signal switcher, and A/V switch creates those video feeds that are blasted onto the screen and our televisions – those displays showing all six movies up for an award at the same time with the show host overlaid on top of them all. A/V switches and signal mixing switchers can be complicated devices. Many are targeted for a specific purpose or have specific features. It’s important to know exactly what you are trying to accomplish to get the right switches. Also, you need to know what equipment you are going to be using and how much of that equipment you will have. Think very critically before going to rent or purchase an A/V switch and use that information to consult with a salesperson or representative that can match you with the right products. If you’ve any questions about AV switchers feel free to give me a call on +353 1 4133892, e-mail me directly ivan@audiovisual.ie or contact us online!